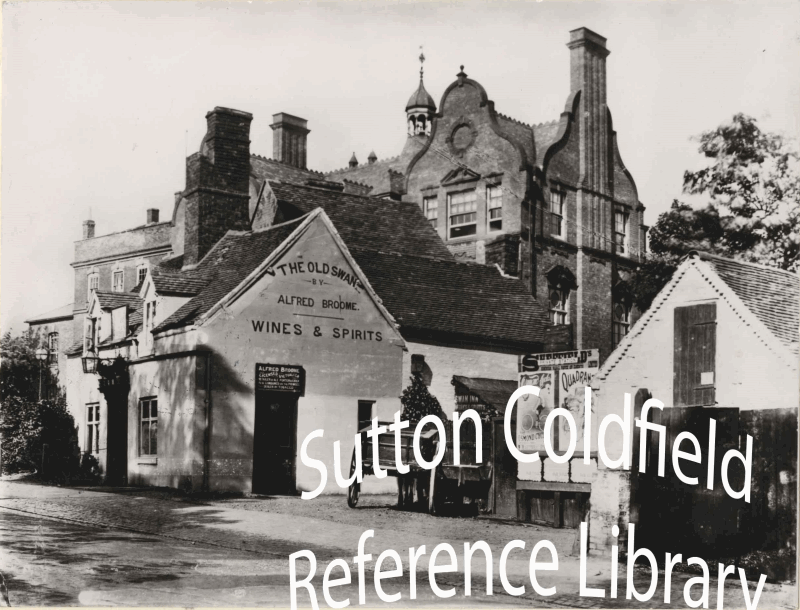 Moritz had already been made unwelcome and treated as a dirty foreigner at several places, so he plodded on through Sutton, “until quite at the end of it I came to a small inn with the sign of the Swan, under which was written Aulton, brickmaker. This seemed to have something in it that suited me, and therefore I boldly went into it”. He spent a comfortable night, and noted that he only paid one third of the Oxfordshire prices. The inn later became known as the Old Top Swan, a relatively humble building with low ceilings and dark stairs dating from Elizabethan times, but it flourished as being the first inn in Sutton for travellers along the turnpike road from Lichfield. In 1824 the Swan was owned and occupied by Charles Spencer, but later in the century the publican, Alfred Ogden, was only a tenant. Alfred Ogden is listed there in 1888, then in 1896 it was Alfred Broome, and by 1900 Richard Clarke had taken over. When the Boer War broke out in 1899 Richard Clarke was of the opinion that the British should have been able to reach a peaceful treaty with the South African Boers, but were mainly interested in the gold mines. This was an unpopular view at a time of intense patriotic feeling, which reached a pitch when the siege of Mafeking was lifted (Mafeking night), when an angry mob gathered outside the Old Top Swan. This was on Saturday May 19th 1900, and no damage was done, but the following Thursday a larger, more violent mob gathered, and the inn was severely damaged by the hail of stones and brickbats thrown at it. The Sutton News reported on June 2nd that the riot was caused by the “supposed pro-Boer views of the landlord, Mr. Richard Clarke”, and added that these had been much exaggerated. Some of the rioters were prosecuted at the Petty Sessions on June 19th, when the moderation of Clarke’s opinions was again remarked on - however, the legend of Richard Clarke as a rabid partisan who flew the Boer flag at every British defeat lived on. The Old Top Swan was demolished, and the site was acquired in 1901 for the new Corporation Technical School, later known as the School of Art.